A half-century ago, modern condensed matter physics was almost nonexistent in China. During the past 30 years, especially since the beginning of the 21st century, the situation has changed dramatically. A number of outstanding young physicists from China with cutting-edge research achievements now have global recognition. How did this transition occur? I was one of about 8000 Chinese scientists trained in the former Soviet Union for Diploma or Ph.D. degrees in the late 1950s and early 1960s. After returning to China, I was appointed a group leader at the Institute of Physics (IoP), the Chinese Academy of Sciences (CAS), even though I did not have a Ph.D. The lack of experience and scientific exchange was partially made up by intensive self- and mutual education. A group of almost starving young people passionately studied and disputed the latest results in the literature (fortunately, scientific journals were available at IoP). Unfortunately, that joyful time did not last long. In 1966 the Cultural Revolution broke out in China, and normal research and education activities were almost completely stopped. In 1969, I was sent to the countryside to do manual labor, to be “re-educated” by farmers. Research work was out of question under those conditions. Nevertheless, something magical happened after I returned from the countryside in 1971 — “Ping-Pong Diplomacy.” Here, the exchange of table tennis (ping-pong) players between the United States and People’s Republic of China (PRC) in the early 1970s marked a thaw in Sino-American relations that paved the way to a visit to Beijing by President Richard Nixon. Following the ‘Ping-Pong’ Diplomacy, China slowly started to open up to the West. C.N. Yang, T.D. Lee, and other American scientists of Chinese descent visited mainland China and gave lectures. We intellectuals “smelled” renewed opportunity to do research work again. There was no direct scientific exchange between the U.S. and China, but China was able to send a small delegation to attend the annual meeting of the Canadian Association of Physicists. Although the scientific journals were not displayed in the library of IoP, they still arrived. They were just left unpacked. We rushed to the library and found with a big shock that during the Cultural Revolution in China, a genuine revolution was taking place in the studies of phase transitions and critical phenomena in the world. The strong feeling of lagging far behind urged us to take immediate actions: We started again the intensive process of self- and mutual-education with hunger and thirst; we read the important papers one-by-one and discussed them in detail at group seminars. It was not an easy job: the stacked lecture notes had thicknesses of the order 30 – 40 cm, but it was a genuinely exciting and enlightening time. The main outcome was two-fold. With Bailin Hao, we were able to make calculations of critical exponents for continuous phase transitions. We also accumulated enough materials for systematic lectures in that area and for a semi-popular book in Chinese on phase transitions and critical phenomena. The book was very well received by the Chinese scientific community, in that all copies of the three earlier editions were sold out, and the fourth one is under preparation. Many young colleagues told us later that they benefited a lot from reading that book. Another important event took place in 1975: An American delegation of solid state physicists visited China in September and October for almost one month. The delegation was led by Charles Slichter from the University of Illinois, and included four physics Nobel Laureates: John Bardeen, Nicolaas Bloembergen, Ivar Giaever, and Bob Schrieffer. The delegation spent three full working days at IoP and obtained quite a good picture of the actual situation. I happened to be the interpreter of Bob Schrieffer’s talk on solitons and could present my joint work with Hao on the critical exponent calculation. Our American colleagues were very much impressed as evidenced by their comments in the published official report Solid State Physics in the People’s Republic of China (National Academy of Sciences, Washington, DC, 1976). To tell just a small episode: During Bob’s lecture at IoP, I reminded him, beyond my interpreter’s duty, when the key word of his talk — “Soliton” — escaped from his mind temporarily. For me that was nothing special, as I had read his paper in advance. However, Bob was quite pleased and told the story to several friends, including Stig Lundqvist from Sweden, who would later invite me to join the staff of the International Centre for Theoretical Physics (ICTP) in Trieste, Italy. In 1978 I got permission to travel abroad again after a 17-year interruption, and went to Brussels to attend the Solvay Conference, where I met Phil Anderson, Leo Kadanoff, Mike Fisher, and many others. Later I visited Bert Halperin’s group at Harvard for more than a year. That was an inspiring experience of true re-education to gain fresh feeling of frontline research. Bert jokingly called me his “senior postdoc.” “Senior” is true, as I am 4 years older than he, but I do not have a Ph.D. at all. In 1983 I met Stig Lundqvist at IoP in Beijing, and as mentioned above, he kindly initiated my involvement with ICTP, an event which changed my professional life in a fundamental way. In 1985, before joining ICTP, I received a heavy-weighted letter from Abdus Salam, the founding director of ICTP saying: “We would like the condensed matter activities in developing countries to be enhanced through your presence here at the Centre. … We all look forward to a second revolution in condensed matter activity in developing countries with your appointment and through your influence.” One can imagine how much pressure and drive was there for me from this kind of anticipation. The ICTP and its sister organization, the International School for Advanced Studies (SISSA), have played a tremendous role in promoting science and education in developing countries, especially after China suffered badly from isolation and destructions during the Cultural Revolution. Thousands of young Chinese scientists visited ICTP-SISSA as postdocs, trainees in the Italian laboratories, associate members, participants of schools/conferences, and many of them used it as a stepping stone to the broad international arena. During my tenure at ICTP (lasting almost 17 years), I did my best, under Salam’s supervision and following his advice, and that token contribution was well recognized by colleagues. In 2007, I was awarded the American Institute of Physics John T. Tate Medal for International Leadership in Physics, established for non-Americans. Abdus Salam also received the same award earlier, in 1978. I felt greatly honored and pleased, as I was trying very hard to follow his steps. In 2002 I returned back to China after retirement from ICTP. Instead of enjoying a relaxed pensioner’s life, I have been still actively involved in research-related activities. However, my role changed dramatically: no longer as a research leader or a science organizer, but rather as a senior adviser, a friend for researchers of different age groups, and a “cheerleader.” In that position I personally witnessed the dramatic changes in Chinese science, and in condensed matter physics, in particular. Surely, these tremendous changes did not come out of blue: strong government support (the budget of NSF China has been increasing by10 to 15 percent annually for the last 10 to 15 years), the large inflow of well-trained scientists (a few thousand for the last 10 years), and the substantial improvement in research facilities are the key prerequisites for materializing the quantal transition. As Abdus Salam said, “Scientific thought is the common heritage of the Mankind”. The scientific exchange during the Cultural Revolution was rather limited, but it was crucial for our scientific survival and for research continuity. The personal contacts established then were extremely helpful for recovering our scientific careers and building up successful international collaboration after China’s opening up to the outside world. The international exchange, especially the helping hand offered to us when we were under severe isolation, is a most indispensable factor for this current success. We Chinese scientists will never forget it! 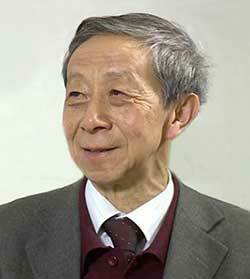 Lu Yu is a professor at the Institute of Physics, Chinese Academy of Sciences in Beijing, China. He is a Fellow of the Chinese Academy of Sciences, APS, ICTP’s partner The World Academy of Science (TWAS), and former head of the Condensed Matter Physics section at ICTP.